Tree to 25 m tall; bark grey, irregularly fissured, later flaking to leave paler patches. Branchlets brown, sparsely pubescent, glabrescent. Leaves paripinnate; stipules c.9 × 2 mm, narrowly elliptic, upper parts early caducous (only seen in seedling material); petiole 2.5–4(6) cm long, sparsely pubescent, glabrescent; rachis (7)12–19 cm long, almost glabrous; leaflets opposite to subopposite, in (3)4–6(7) pairs, 4–8.5 × 2.5–4.8 cm, broadly ovate to broadly elliptic, almost symmetrical, apex rounded or emarginate, base cuneate, glabrous, usually with a small dot-like gland at proximal side of base either on lower surface in angle between margin and midrib or on the margin itself; venation slightly prominent on both surfaces, marginal vein prominent. Inflorescences appearing leaf-opposed, usually simple, racemose, 4–7-flowered; axis sparsely to densely puberulous; bracts c.6 × 5 mm, broadly ovate, puberulous, early caducous; bracteoles paired, 6 × 4 mm, broadly ovate, puberulous, caducous; flowers spirally arranged on the axis; pedicel c.5 mm long. Hypanthium c.15 mm long, puberulous like the pedicel. Calyx lobes 4, puberulous outside, glabrous inside, margins sparsely glandular-pilose particularly towards the tip, the outer two c.1.7 × 0.9 cm, broadly triangular, somewhat auriculate at the base, the inner two c.2 × 1.2 cm, broadly ovate, cuneate at the base. 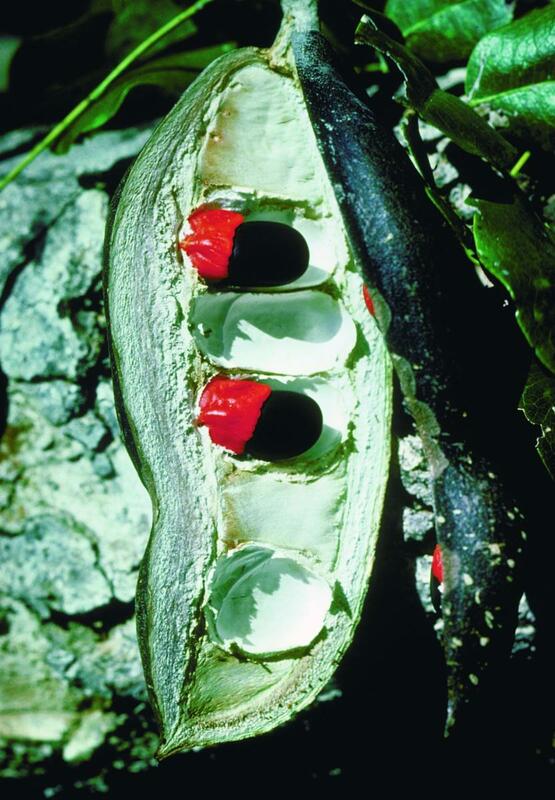 Petal entirely red or green with a red median line, c.3.5 cm long, claw c.2 cm long, pilose near the base, abruptly expanded into a broad bilobed lamina c.2.5 cm wide. Fertile stamens 7–9; staminodes usually 2; filaments c.35 mm long, pilose near the base, otherwise glabrous; anthers dorsifixed>i>. Ovary c.3.5 × 1.5 mm, oblong, pilose particularly on the margins, 10–15-ovulate; stipe c.3 mm long; style c.25 mm long, glabrous; stigma capitate, papillose. Pod 10–20 × 5–8 cm, straight, oblong, flattened, apiculate, the pedicel attached asymmetrically at the base, glabrous, tardily dehiscent, 5–13-seeded. 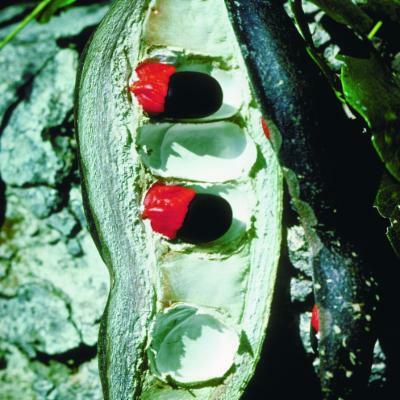 Seeds arranged at right angles to the long axis of the pod, smooth, black, 2.6–3.5 × 1.2–1.7 cm, ellipsoid; aril orange or red, 0.8–1.3 cm long, cup-shaped. Germination epigeal; first true leaves opposite, paripinnate, in 4 pairs, elliptic, apex acuminate, base cuneate. Tree 1.5–35 m. high, with very spreading crown; bark grey to pale brown, reticulate, or coming off in large flakes leaving yellowish-brown patches; branchlets pubescent, puberulous, or glabrous. 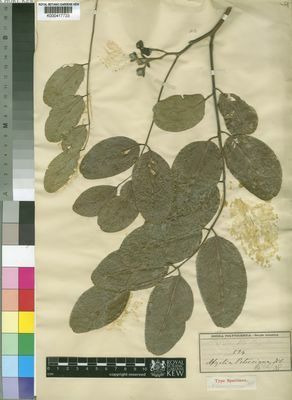 Leaves:rhachis with petiole 6–32 cm. long; leaflets (mature) (3–)4–6(–7 or, fide Roti-Michelozzi, to 9) pairs, petiolulate, ovate-elliptic, oblong-elliptic, or elliptic, 2.3–9(–12) cm. long, 1.5–6.0(–7.2) cm. wide, rounded, or sometimes obtuse, and often emarginate at apex. Inflorescences erect, of simple or once-forked racemes; axis 2–7.5 cm. long. Flowers very sweetly scented, with hypanthium 1.1–2.5 cm. long. Sepals shortly pubescent or puberulous outside, outer 2 elliptic, 0.9–1.7 cm. long, 0.7–1.3 cm. wide, inner 2 obovate-spathulate, 1.7–2.5 cm. long, 0.9–1.8 cm. wide. Large petal upwardly-turned, 2.5–4.5 cm. long, ± pubescent and green outside, red inside, with a rather long claw suddenly widened into a deeply bilobed lamina 2.2–3.1 (–3.8) cm. wide. Stamens 7(–9) fertile, with glabrous to pubescent filaments mostly green like the ovary. Pods straight, 7–23 cm. long, 4.5–8.3 cm. wide. Seeds black, oblong-ellipsoid or ellipsoid, 2–3.4 cm. long, 0.9–1.7 cm. wide, with an orange, red, or vermilion, cup-shaped basal aril. Thickets, woodland, lowland dry evergreen forest; 0–1340 m.
Intsia quanzensis (Welw.) Kuntze ex Engl. F. White, Forest Flora of Northern Rhodesia p. 98, fig. 21/J (1962). Dale & Greenway, Kenya Trees and Shrubs p. 96, fig. 18 (1961) (as “ cuanzensis ”). Roti-Michelozzi in Webbia 13: 142 (1957). Torre & Hillcoat in Consp. Fl. Angol. 2: 215 (1956) (as “ cuanzensis ”). J. Léon. in Flore du Congo Belge et du Ruanda-Urundi, 3: 354, fig. 27/B (1952) (as “ cuanzensis ”). J.P.M. Brenan, Check-lists of the Forest Trees and Shrubs of the British Empire no. 5, part II, Tanganyika Territory p. 87 (1949). R. O. Williams, Useful and Ornamental Plants in Zanzibar and Pemba p. 109 (1949), pro parte, excl. fig. rami floriferi (= Intsia bijuga). Battiscombe & Dale, Trees and Shrubs of Kenya Colony p. 63 (1936). Burtt Davy, Fl. Pl. Ferns Transv. 2: 327, fig. 53 (1932). Chalk, Burtt Davy & Desch, Some E. Afr. Conif. and Legum. (For. Trees & Timb. Brit. Emp. 1): 26, fig. (1932). Bak. 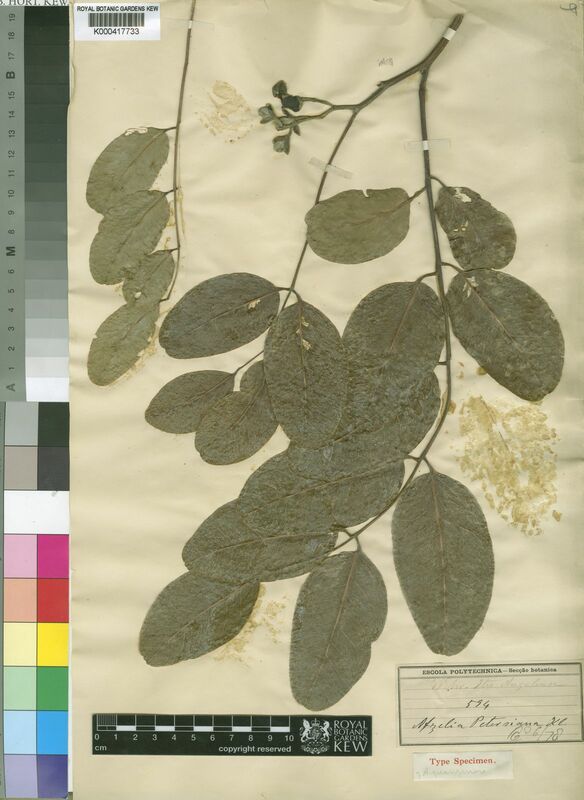 f., Leguminosae of Tropical Africa: 701 (1930). Welw. in Ann. Conselho Ultram. 1858: 586 (1859).